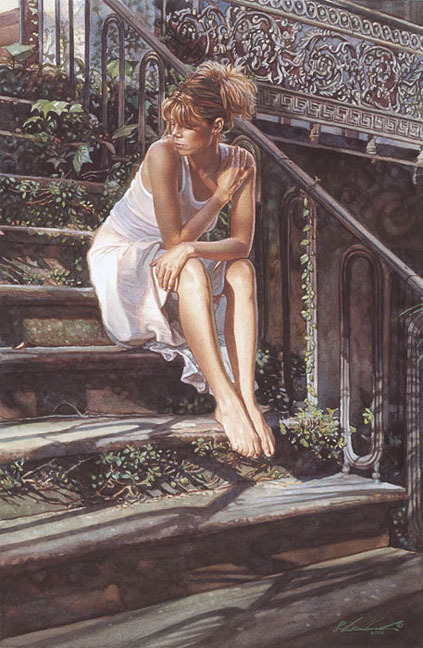 The beauty of a painting by Steve Hanks is just as often matched by the thought and story behind it. Contemplating the Necessary Steps is one of a series of paintings that Hanks created as expressions of the healing process. Throughout, as the model makes her journey, she climbs higher and higher up the staircase. Both "One Step at a Time" and "A New Beginning" are other fine art editions that are part of this series.